Seldom has a food ignited as much controversy as foie gras. Depending on who you talk to, foie gras is either a delicious and enjoyable delicacy or a type of food that should no longer be available for consumption. Foie gras is the fatted liver of a goose or duck. Unlike a regular goose or duck liver, however, the farmers growing geese and ducks for foie gras feed the animals in certain ways in order to specifically fatten the liver. The result is a flavorful, buttery, and rich food that many around the world consider a delicacy. Foie gras originated in France, and much of the world's foie gras production still takes place there. Other areas that produce foie gras include the Hudson River Valley in New York, as well as other countries including Bulgaria, China, and Hungary. The United States produces about 1.4 percent of the world's foie gras. In France and other countries, foie gras is created by intentionally fattening the goose or duck liver using a process called gavage. In gavage, farmers insert a metal or plastic tube down the animal's throat. They attach a funnel to the tube, and then use an electronic pump to force a corn or grain mash fortified with fats and vitamins through the funnel and tube several times per day. This continues daily for four to five weeks to fatten the liver before slaughter. The controversy surrounding foie gras relates to gavage. Many, including animal welfare groups, feel this type of feeding is cruel to the ducks and geese, and causes them pain and discomfort. Along with the inhumane feeding method, groups such as the Humane Society also feel that the fatty and distended livers make it difficult for the animals to walk or be comfortable, and that this feeding method may also lead to painful esophageal scarring. Scratching and scarring of the esophagus may also lead to an increased chance of infection. Likewise, the European Society of Dog and Animal Welfare shares the opinion that gavage is detrimental to the welfare of the ducks. The controversy has led to ban on foie gras production and sales in a number of locales including the state of California, as well as in Argentina and Israel. Foie gras was also banned briefly in Chicago starting in 2006, but due to pressure by multiple groups including those in the culinary industry, the ban was lifted in 2008. The California ban took effect in 2012 to great controversy in the culinary world. Some chefs felt the ban was appropriate, while others used foie gras as common menu ingredient. Challenges to the constitutionality of the ban were defeated in 2014, and the ban was upheld by the U.S. 9th Circuit Court of Appeals. While animal welfare groups feel foie gras production is detrimental to geese and ducks, many others disagree. This is particularly true of people in the culinary industry, as well as foie gras manufacturers and producers. While some chefs, such as Wolfgang Puck, will not use foie gras as an ingredient and support its ban, a some chefs support the ethical and human treatment of animals but don't believe that use of foie gras from humanely raised animals is unethical or immoral. Many argue that gavage is minimally invasive and quick, and that the animals do not appear to be mistreated. Ducks and geese do not have a gag reflex and have flexible esophagi, so the process may be less traumatic than some believe. 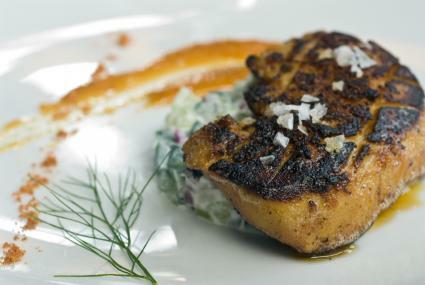 Foie gras tends to be expensive, and many home cooks find it intimidating to work with. Foie gras is available cooked or fresh in whole lobes of the liver, or it is made into pâtés and terrines. Many home cooks prefer the pre-cooked pates and terrines, because they are easy to use. When working with fresh or frozen foie gras, cooks must remove the veins before cooking. The easiest way to do this is to slice the lobe into thick pieces and then remove the veins from the cross sections of the slices. Thaw foie gras in refrigerator if frozen. Slice foie gras into two-ounce slices. Lightly score foie gras on each side in a cross-hatch pattern and season with salt and pepper. Heat a dry skillet over high heat until the pan is very hot. Do not use oil. Place the foie gras in the hot pan and sear on each side, about 30 to 40 seconds per side. The fat in the liver will keep it from sticking to the pan. Cooking using this method will yield medium-rare foie gras that melts in your mouth. Terrines and pâtés are pastes or mousses of foie gras (or other types of liver) combined with herbs, spices, and ingredients such as truffles, sherry, and cream. These pastes are cooked and create a much more rustic use of the ingredient. You can find pâté or terrine pre-made in gourmet grocery stores or you can make your own. If you are purchasing a premade terrine or pâté, remember not all are made with foie gras. Look for the words foie gras (pâté de foie gras or terrine de foie gras) on the label. 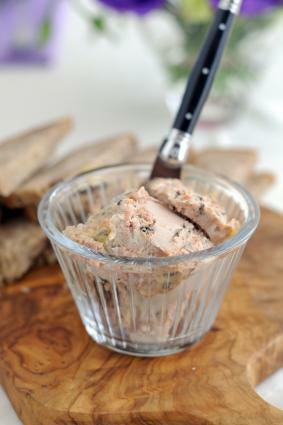 To serve pâté or terrine de foie gras, spread them on baguettes or crackers. While you may be able to purchase foie gras from your gourmet grocery store or butcher shop, many stores don't have it available, or only sell it seasonally. However, foie gras is available to order online. Dean & DeLuca has foie gras in bocs, mousse, and pate. This company is a respected purveyor of fine gourmet foods and has been in business since 1977. D'Artagnan offers an array of Hudson Valley foie gras products including whole lobes, mousses, and other delicacies. The company specializes in gourmet items such as truffles, charcuterie, and foie gras. All products are organic and hormone free. Hudson Valley Foie Gras and Duck Products has an online store offering foie gras, duck fat, pâté, and other duck products. The company produces its own foie gras and believes in ethical treatment of ducks used for foie gras. The ducks are cage-free, and specially bred to be more disease resistant. In spite of the controversy surrounding it, many people try and enjoy foie gras. If you've never had it and would like to try foie gras, many fine dining restaurants offer at least one foie gras dish on their menu. Having a taste at a restaurant is a great way to determine whether foie gras might be your next food passion.